You all already know about my love for old photos. There's nothing like an old black & white! This one is one of my faves for sure. It's election day 1926, just 6 years after women had the right to vote. Written on the back of the photo was the date and a note about how excited her mama was to be able to vote in a county election. 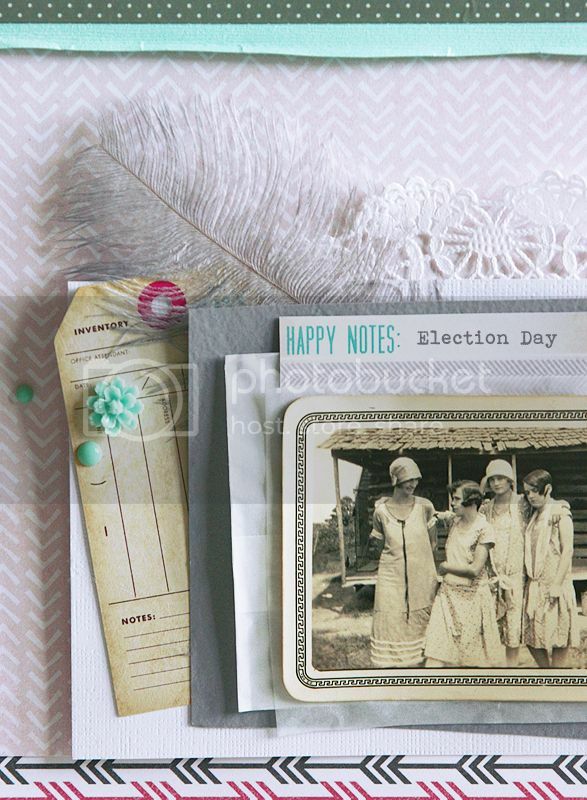 I used the September kit from the Paper Bakery, the papers and the pretty grey feather worked so well with the old pic. Don't you love those hats and dresses! I still have so many old family photos to scrapbook. I honestly hope the boxes never come to an end. I love the glimpse back in time. ***This is today's featured project @ Two Peas!! Woo-hoo!!! Right at the beginning of Summer I took the little kids to the Patchwork Show, a small indy/handmade craft show here on the West coast. We had a great time looking in all the fun booths, roasting home made flavored marshmallows, buying some cute jewelry & t-shirts, made a cool bicycle spin art canvas and even spent some time chatting with Amy Tan's mom. All you scrapbookers know Amy Tangerine ;) We also took our turn in a photo booth! We barely had time to sit before the camera started flashing, but I'm glad we have these funny photos to look back on. I used the September scrapbooking kit from the Paper Bakery, and added in a few sequins and alpha letters from my stash. 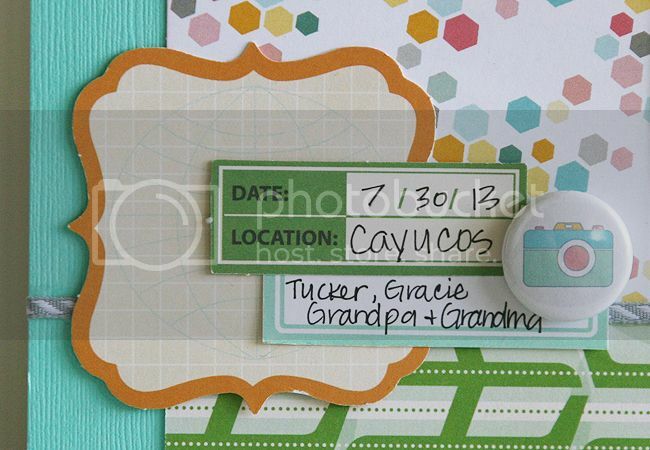 The white rectangle with the circles punched out was a left over scrap of cardstock from another project, but was perfect to highlight a few embellishments. Mike and Amy Smith are nervous about moving from their nice house in Boston to dilapidated old mansion in Falton, New Hampshire. They know they’ll have to start the sixth and seventh grade not knowing anyone, and their new house is just plain creepy. While searching their dusty attic, Mike and Amy uncover an old wooden chest with a mysterious lock. Inside, they find magical red shirts that give them special powers. Together with a new friend, Sam, Mike and Amy must figure out how to harness their new found gifts while keeping them secret from their parents. As their powers grow, they begin a search for two kids who had gone missing in the summer, pitting them against a powerful adversary with mystical powers of his own. Will Mike and Amy be able to unlock the ancient mystery of the shirts? And will they be able to find the missing children before it is too late? The day the book arrived, I opened it and thought I would read just a few pages to get an idea of what the book was about. I could tell this was a book that both of the younger kids would like, so I planned on having Tucker read the book first, then Daddy and I would take turns reading it to Gracie. As soon as Tucker started reading, Gracie kept wandering in his room and asking about the book with "pirate chest" on it. You can guess what happened next right? Yep, she is quite persistent, and he loves to read, so he ended up reading the book to her. Tucker actually read the book in 2 evenings. His first comment after finishing the book was "is there another book, is it a series?" As much as he likes to read, I knew he liked the book with just that one comment ;) His said it was fun to read and each time he thought he knew what was going to happen, something changed and the story went in a different direction. In reading the book to Gracie he read chapters over a weeks time. She liked that Mike & Amy had magic powers when they wore the red shirts, especially the shirt that made Mike invisible. I would place the book in the 7-12 year old category, but it definitely captured a 4 year-old's attention too. And now for the fun part!!! Enter to win a $75 Amazon gift card and a copy of the book! **Disclosure: I was provided a copy of this book for review. Any and all opinions are our own. Here's 2 cards that I made with Art Fair, the September scrapbooking kit from the Paper Bakery. I know I’ve mentioned it before, but cards are just not my thing. I’m not sure what it is, but if it’s not 12×12 I totally stress out. Somehow, these cards came together so quick and easy though, and I had so much fun making them! 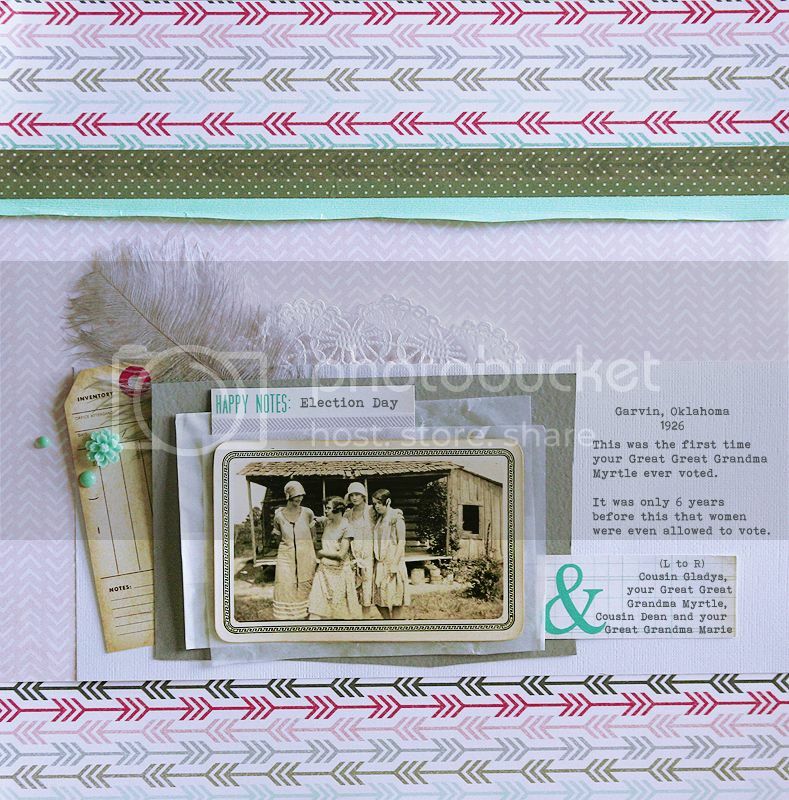 Here's a layout that was up on the Amanda Robinson Studio blog using a FREE file folder cut-file. As you can see, I used the star design. There is a cute heart file folder too! I also used the "Just Another Day" cut-file for my title. I did a little creative cutting with my Silhouette and used just the word "day" instead of the word Friday. I have a layout up on the Amanda Robinson Studio blog today as part of her new Creative Team!! The site just went live today, so be sure to hop on over for a FREEBIE cut file! New files will be added to the shop on a weekly basis, and a new freebie will be available every Wednesday. 1. Comment on this post on the ARS blog. 5. Make any purchase in the store – includes our FREE cutting file! You can enter multiple times – the more things you check of the list, the more entries you will have! Good luck! I'm back with a layout using “Art Fair”, the fabulous new September scrapbooking kit from the Paper Bakery. I used sketch #12 as inspiration, changing it up a bit to make it my own. The sketch is open until the 21st, why not play along for a chance to win a fun prize! 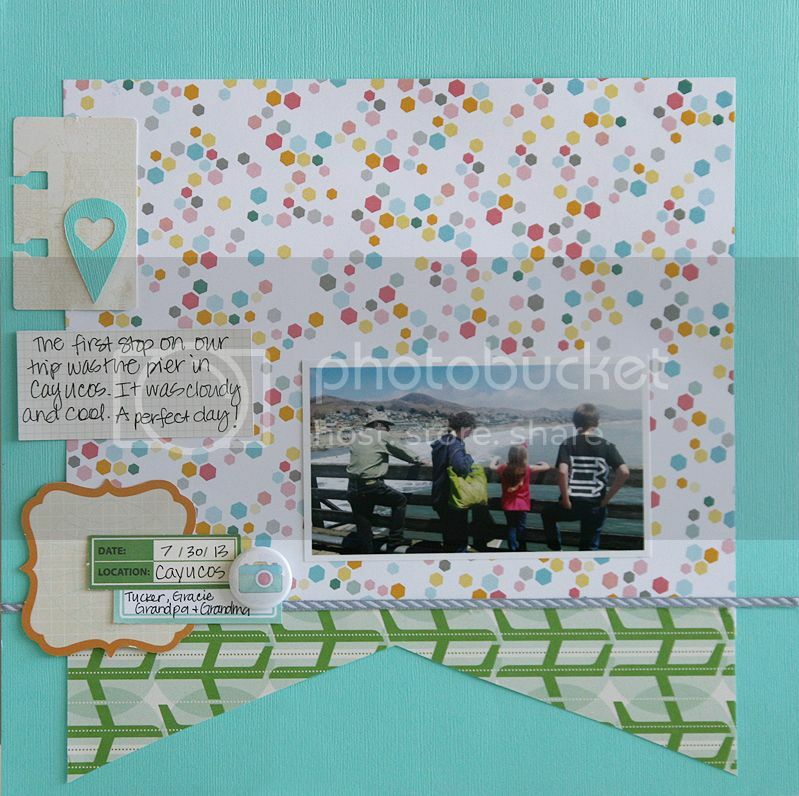 Here's one more layout using "Hello You", the August scrapbooking kit from the Paper Bakery. I used a banner shape as a base for my layout, then layered on the cute October Afternoon die cuts. 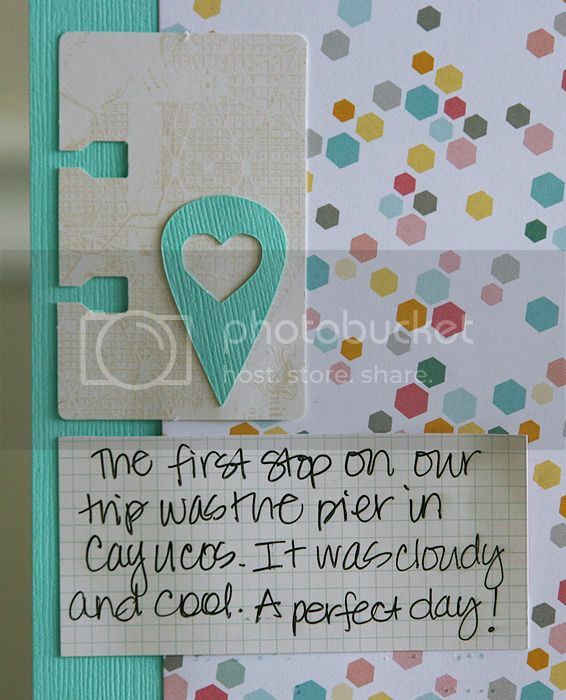 See the grid paper that I added my journaling to? That is actually part of the packaging that the cute October Afternoon die cuts came in!! I love the bright colors in this months kit, just perfect for these summer photos! I know, it's been a whole week since I've posted a project. But let's just say I have the best hubby ever and I was out of town. Nothing like a last minute surprise vacation ;) I still haven't gone through all the pics I took, but I know I'll have some fun photos to post. I *love* the mix of patterned papers on this one, and the fun feather I cut with my Silhouette. It was perfect since it was a pic of Gracie with the bird wings behind her.